I was pretty excited to hear that the next Super Sentai series would feature a dinosaur motif. Recently, Toei has been re-using this motif about every 10 years. Yes it has been that long since Abaranger aired. Now that Big Bad Toy Store has revealed what some of the toys for the new show will look like, well my enthusiasm is just not the same. Following several days of speculation, a picture from the Bandai toy catalog confirm what the suits for this new Super Sentai look like. 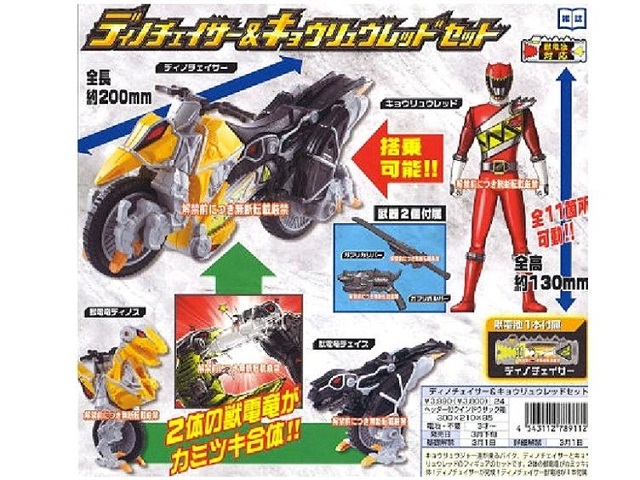 It also reveals that the new team will have motorycyles known as DinoChasers, which are formed by combining two of the dinosaurs. The main weapons of the Kyoruger are the GabCalibur and the GabRevolver. 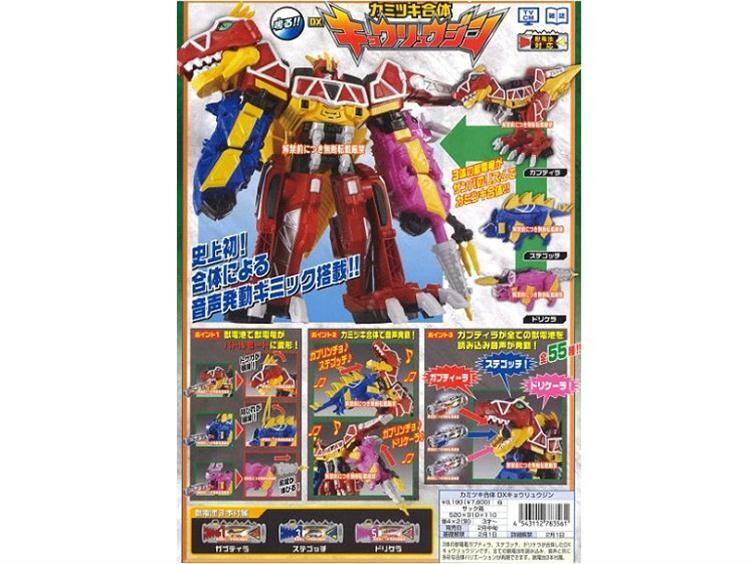 The main mecha, the Kyoryujin, will consist of the Gabutyra (red), Stegotchi (blue) and Dricera (pink). One of the gimmicks for this toy will be the fac that the body of the robot will make a different sound every time another one of the mecha is attached as arms.Different formations will also have different music that will play, such as western, samba, etc. The Tyrannosaurus will activate the sounds of the various arm mecha by using "batteries" which reside in each of the mecha. For example, the auxilary arms provided by the other two members of the Kyoryuger, Zactor (Green) and Parasagan (Black), will elicit western music and phrases from the Kyoryujin. Seriously? THESE are the zords? The color palette looks like a paint factory exploded. And the designs are devoid of inspiration. I will definitely NOT be picking these up. This may be the third time around for dinosaurs in Super Sentai, but in this case, the third time does NOT seem to be the charm. The Red ranger looks like a mash-up between the AbaRanger and Charlie Brown- uh, Gingaman suits. Ouch. These look like shell-formers, sadly, even though this time they actually seem to be able to transform rather than be ungodly blocks of $#!+ for a change. Like a mash-up of "Kamen Rider Double"'s electronic gimmick. Yeah... I'm not really feeling this one either. Welp, that's two more intentionally-large gaps in my Super Sentai collection, alongside the aforementioned Gingaman. There is some inspiration there. The body of red mecha look like the side of a barn. I don't know. I'm REALLY digging these designs. I can't wait for Gobuster to be over so I can watch it! You gonna pick up the mecha?